A few years ago, I made a list of relevant investors that I wanted to approach when I was fund raising for my startup. I kept that list up to date as I went through the funding rounds. Forward a few years and I was at Techstars. Founders approached me all the time and said: „Whom shall I approach for fund raising?“ So I took my Excel list, added more investors, turned it into an online spreadsheet and shared it with the Techstars founders. Then something unexpected happened. I was in hospital, waiting for my wife to give birth to our second child. In that particular moment, Phil Wilkinson decided to share my spreadsheet on Twitter (thanks Phil! 🙂 ) Within an hour, I had hundreds of founders who asked to be given access to the list. They then gave permission to yet other founders and investors and so forth. Within a day, the sharing permissions of the spreadsheet were completely broken, my inbox was flooded, and the crowd had taken over. My daughter obviously didn’t mind, she was happily born later that night. In the next days, I created a new, clean spreadsheet with clean access privileges and moved the old spreadsheet information across. This sheet has been used by 1000s of founders ever since, there are typically a few dozen people on it every time I look. But there were lots of problems with the new spreadsheet. People link forms to it by accident. People write the most annoying things into it. Other people are threatening to sue me over some of those things. Funds are deleted for no reason, incorrect information gets added, versions get rolled back and forth without control. In addition, the information was useful for me, but not so useful of the founders. I knew which funds were interested in which geographies and sectors. So I ended up explaining each fund to each founder: „This is a Swedish VC that makes Series A investment in Nordic companies…“ and so on ad so forth. So after a while, I stopped using my own spreadsheet. Instead, I copied it, created a private version, tidied it up and started making it a lot better. I added fields, so I don’t need to explain each investor anymore, it is now completely obvious what they do and where they focus. I then gave comment only access to the founders in the Techstars Berlin class. By now, the list is starting to take on a life of its own again. History repeats. The new sheet now has more concurrent users than the old one. There are far more investors on it. The structure of the information is much better. Most importantly, only a very small number of people can make edits. Everybody can comment though, and contribute in this way. So, in the last few days we did a little count and found that just the funds that we have listed on this spreadsheet that are currently actively looking to invest in European startups total some €15 Billion. Lots more than I thought. And that doesn’t even include all the money family offices etc have to invest. 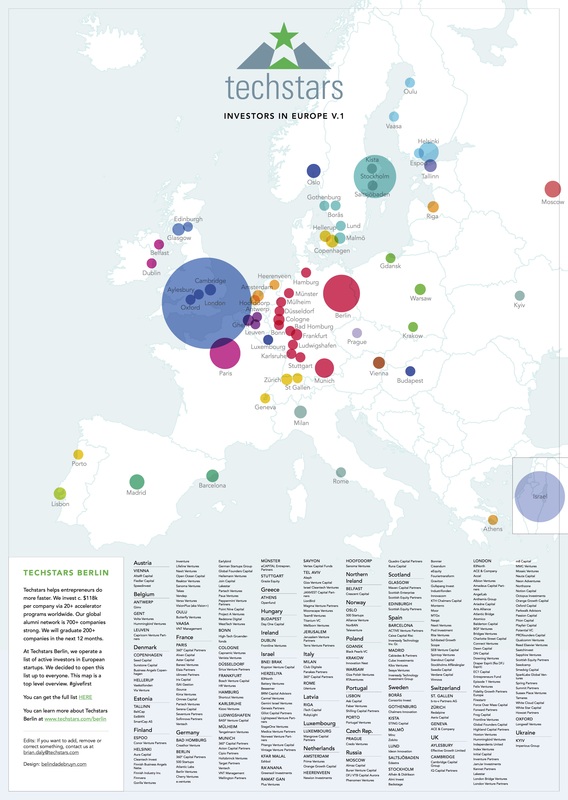 We also made a little map that visualizes where these funds are located (Investors from outside of Europe investing in Europe are not shown). The list is open, everybody can access it, everybody can contribute to it (either via comments or by emailing us). This time it is not just me, but I am putting some Techstars’ resources behind it to make it awesome and keep it up to date. We will keep adding investors to it, until we have all investors on it that routinely make investment in European startups. So far, €15BN and counting…lots more to come. One of the most annoying aspect of fund raising is when investors ‚go slow‘ or ‚go dark‘ on a company. Meaning the investor doesn’t say yes and they don’t say no. Instead, they respond very slowly to the emails or calls of the founders. Below is advice I give to founders. The key is understanding the different investor mindsets. You can then act accordingly. The investors passes right away or they take a look and then pass firmly. This is actually great behavior; it saves founders a lot of time. The only way I have seen that can change that investor’s mind is when another investor / board member gets in touch and says: „You should look again at this company; I think you have read the situation incorrectly. “ Unless you can do this, it is exceptionally difficult to convince investors to take a second look. Instead, accept it gracefully and don’t annoy them. Sometimes a junior / inexperienced investors request a lot of specific information upfront. This happens before it is clear whether there is real partner level interest in the company. This can take up a lot of the founders’ time and should be politely refused. The investor should first establish whether there is real interest. The investor is slow to respond. ‚Going dark‘ is a term often used. They say: „We are very busy with internally processes and are doing due diligence.“ There are three dozen variants of this. What they actually think is the following: „I can’t make up my mind about this company. It is not so compelling I feel I need to make an offer. Yet it also isn’t so disinteresting I feel I need to reject them.“ It is highly unlikely that this investor will lead your round. What you can do is to try to either convert them to a ‚soft-circle‘ or to qualify them out. You can go back and say: “It doesn’t feel as if you are interested in leading the round, tell you what, I will keep you in the loop and once I have a lead and there is space left, I will get back to you, how does that sound?“ If they say yes, try to crystallize the conditions under which they would say yes to a deal. Get that in writing if you can. If you cannot progress them in this way, qualify them out. The investor is interested and happy to commit. But their check or interest level won’t crystallize the round. That is fine. Soft-circle them. Try to get them to a ‚conditional yes’. A conditional yes is not a term sheet, but a statement where the investor says under which conditions they would be happy to invest. There is a scenario where you will have multiple soft-circled investors. You can then issue a term sheet yourself and have one investor do the legal work. Every time when I have been involved with a fund raising and a firm received a firm yes, this happened relatively quickly. There was speedy and continuous communication. Ideally you have multiple investors say yes at the same time so you can compare them and then work with the firm(s) of your choice. Those are the five most typical initial outcomes of an investor discussion. The key for all involved is to get out of time wasting and slow discussions ASAP. Push to either No, Conditional Yes or Yes. And then you can construct the round accordingly.